Spotted these fantastic things on DKNY PR Girl's tumblr. Pretty much what I want to wear every day for the rest of my life. 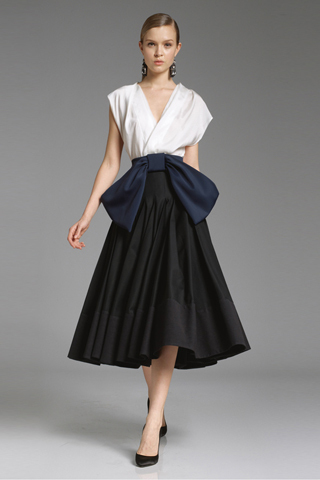 I'm huge on billowy circle skirts and hourglass silhouettes. Pass me any well-tailored white shirt and I will have a mini gushing fit. Then there's also this pair of platforms from the DKNY Summer/Pre-fall show. All I'm saying is they better sell them because I've been looking for platforms like that since April. That second ensemble makes me so happy <3 :). I need the first ensemble, especially the shirt. The collar is perfection. By the way, are you excited about the RBL pre-order this weekend? I got the entire set, plus Dead Calm. I'm terrible; I still haven't worn any of my first BiB batch! Leigh- Oh dear, if I can be counted on anything it would be for my RBL pre-orders. I already own Jane and Catherine H so I only got Catherine to complete my Queens set. Killa Red and Moxie went in of course, and I added Opaque Pink just because I have a lack of true neutrals (as in no shimmer, holo etc) in my stash. Do let me know how Opaque Pink looks! I haven't tried any of RBL's more unassuming neutrals. You're surely right about Anne and me. The trouble is I have a fuchsia pedi at the moment, and I cannot abide a clashing mani. Currently I'm wearing Dior Silver Lake (love, swatch coming up soon) and up next probably is Gris Montaigne. Once I change my pedi, I promise, I'm doing Anne! THE SHOES IN THE 3RD PIC!